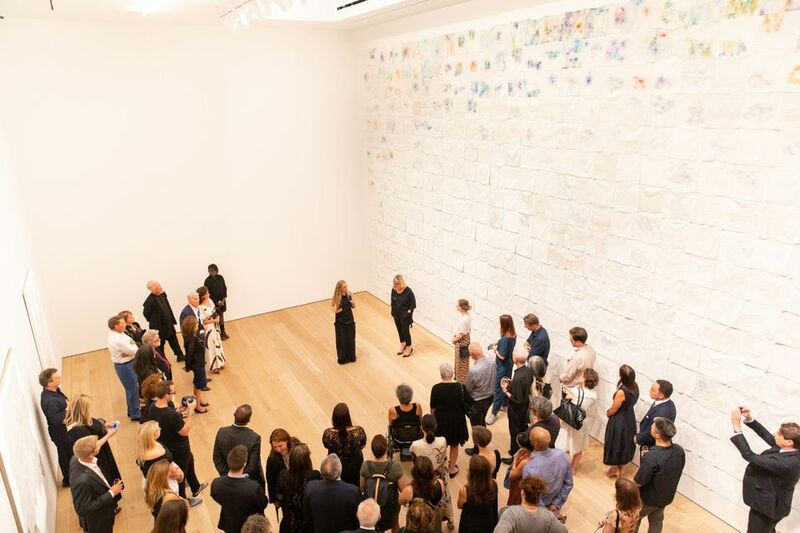 In a blithely optimistic move, to counter a feeling of the other shoe dropping on the nation this autumn, the New York dealers Rachel Lehmann and David Maupin inaugurated their new, purpose-built gallery in Chelsea with an exhibition by Liza Lou, the unrivalled bead queen of art. The artist, who maintains studios in her native Los Angeles and in Durban, South Africa, found in her signature material (glass bead) a suitable vent for outrage as well as visual poetry. Suiting up in a full Hazmat rig, she’d taken a hammer to hand-sewn, densely plotted glass beads to make what appear to be repeating squares of distressed textiles treated to a pale brush—the “clouds” of her show’s title. One lighter-than-air grid takes up an entire 50-by-23-foot wall of the main, two-storey space. “I made this piece for the Sydney Biennial,” Lou said. “It just happened to fit here perfectly.” Like a glove. The architect Peter Marino designed not only the gallery but the whole building, and I am here to tell you that it actually looks like a gallery and not a Chanel or Barney’s store. (Wood floors, windows for daylight instead of display.) The Hill Art Foundation private museum will soon take shape in another huge, two-storey space upstairs. 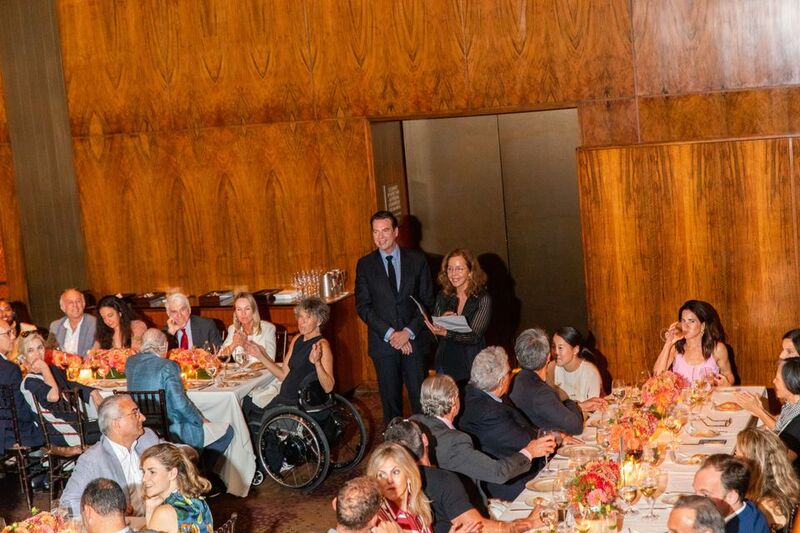 “My first job was a gallery in SoHo,” Marino said, at the banquet that followed uptown, at The Grill, in the Mies van der Rohe-designed Seagram Building, where the guest list might have been the envy of any gallery in town. It included a number of in-house artists from a roster that maintains an impressive demographic, racial and gender balance. 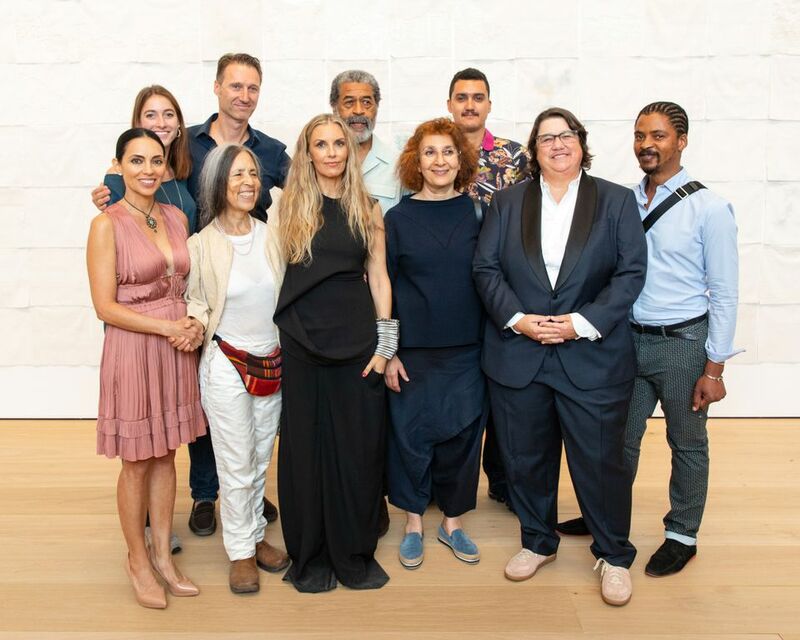 There was Teresita Fernández and Nari Ward, who has a solo show at the New Museum next February, Shirazeh Houshiary and Hernan Bas, who confessed that he somehow missed the news of Lou’s opening and came straight the party. Marilyn Minter and David Salle show with the gallery in Hong Kong, but they are New Yorkers, and so they were there too, as was Alex Prager and Mickalene Thomas. “When your dealer invites you to your new gallery’s opening and offers to pay your way, you kind of want to show up,” said the Los Angeles photographer Catherine Opie, who’s next on the Lehmann Maupin calendar. “My show’s in January,” said McArthur Binion, almost literally licking his chops over the prospect of making public a body of work that the Chicagoan said would open an entirely new chapter in his career as a painter. Nonetheless, other people came too: the newbie Metropolitan Museum director Max Hollein and the curator Ian Alteveer left the opening of their acutely elegant, Jack Whitten retrospective at the Met Breuer to join the Guggenheim Museum’s director Richard Armstrong, the New Museum’s director Lisa Phillips, the Whitney Museum’s chief curator Scott Rothkopf, the Detroit Institute of Art’s curator Laurie Ann Farrell, the architect Annabelle Selldorf, and the collecting couples J. Tomilson and Janine Hill, Phil and Shelley Fox Aarons, and Sherry and Joel Mallin. And the art season hadn’t even started yet.